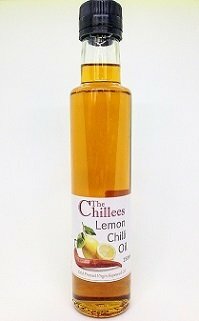 Somerset Cold Pressed Virgin Rapeseed Oil infused with Chilli & Lemon. All the delicious nutty flavour of the oil, with a freshness of lemon & slight warmth of chilli. Ideal for cooking & dressings; delicious with fish or chicken, why not try drizzled on avocado with a little sea salt & crispy bacon. We use to start our risottos or add some to the water when cooking pasta or rice; it flavours all through without adding too much oiliness. Ingredients: Cold Pressed Virgin Rapeseed Oil, Chilli, Lemon.